Super Fast Thermometer: Instant digital readout within 4~5 seconds, ºF/ºC switchable, 10 Minutes Auto-off and HOLD feature. Perfect for Kitchen, Outdoor Cooking, BBQ, Liquid, Food, Meat, Candy, Coffee, Milk and Bath water temperature. Voice Function: Just click the voicing button, this GDEALER Talking Meat Thermometer will broadcast the current temperature. No need to stare at the screen, let your eyes get freedom when cooking. Blue Backlit LCD Display: You can see the current temperature clearly by pressing this luminous button in the evening. It makes barbecue and picnic easier and more convenient at night. Wide Temperature Range: -58°F to 572°F(-50-300°C). Display resolution: 0.1ºC (0.1ºF). Making these utensils the best for use when grilling on your gas barbecue or turkey fryer, making candy, using hot oil to deep fry, brewing beer and wine and even making cheese and bread. GDEALER Talking Instant Read Cooking Thermometer is the perfect cooking thermometer! I absolutely love how quickly I can get a reading and that it's accurate. I've always had the hardest time cooking chicken because I'm always worried about under cooking and because of this I tend to really overcook it. With GDEALER Talking Instant Read Cooking Thermometer I was able to monitor the temperature of the chicken as I cook it and remove it from heat once it reached the desired temperature. The chicken was actually moist and delicious. I also really like that I can push the button and it will read the temperature for me. This is really handy while cooking because I don't have to remove it to read it. The GDEALER Talking Instant Read Cooking Thermometer also lights up so you can see if you're barbecuing in the evening and happen to need a little extra light. GDEALER Talking Instant Read Cooking Thermometer makes me a confident cook when I'm cooking meat because I no longer have to guess when it's done! 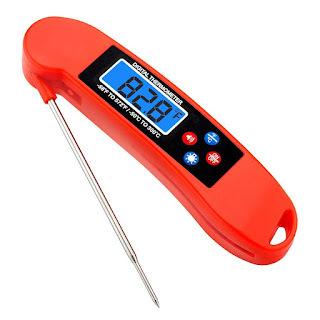 I highly recommend this GDEALER Talking Instant Read Cooking Thermometer!